This is my fourth most-visited post of all time with 21,984 visits on this blog and the second most-visited post on my gardening-only blog (www.gardenmuse.wordpress.com) with 47,834 visits. 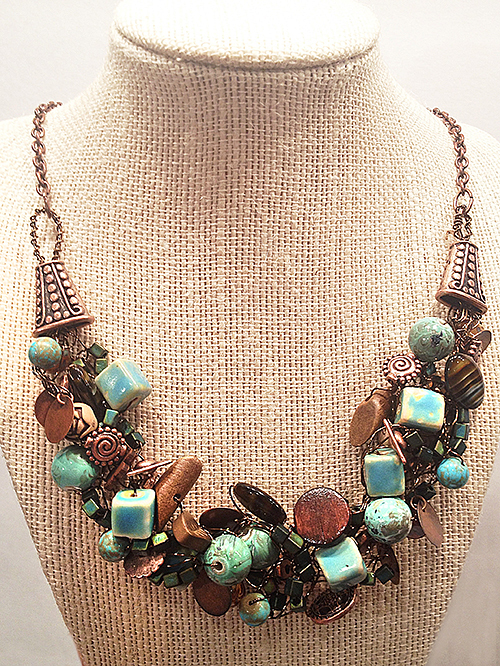 That’s a total of 69,818 visits for this one craft project! 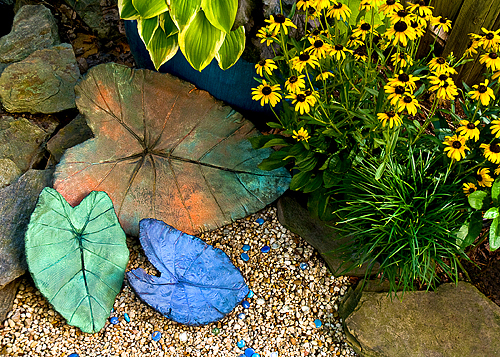 My friend Debbi and I have been making these concrete leaf castings for several years now, and my Garden Club members have also tried their hand at it. We have used Portland cement type 1 for our earlier creations, but then started making them with Quikrete instead. Several artists recommend using vinyl patch instead because it’s stronger, lighter in weight and picks up more detail from the leaf texture and veining. It’s also more resistant to flaking and cracking associated with traditional cement mixtures. The next batch I make will be with the vinyl patch product! This site here has step-by-step instructions (plus a youtube video). The steps are the same no matter which product you’re using. Click here for Craig Cramer’s blog posting, “The Secret to Great Leaf Casts.” He recommends using Quikrete. Click here for another site with an extensive gallery for inspiration. David, the artist, recommends waiting 30 days before painting your creations. (I’ve never waited that long—don’t know if I would have the patience!) He mixes Quikrete with his concrete mixture, but I’m not sure what the ratio is. At the very least, his photo gallery will endlessly inspire you! Since most of the leaves we create are smaller, we don’t often do the chicken wire reinforcement. Larger elephant ears do require a bit of reinforcement, though, and we have made some of those (the larger the leaf is, the more likely you’ll need two people to move it when it’s dry!). Most of the ones we have done are made with leaves from hostas, pokeweed, grape leaves, caladium leaves, and smaller elephant ears. Leaves that have nice, deep veins work best. If you want to hang your leaf on a fence or wall, insert a curved piece of clothes hanger or thick wire (formed into a loop) into the back before the leaf is cured. Artists Little and Lewis suggest using powdered pigments to color your concrete before creating the leaves. Read more about their approach with hosta leaves here. They have created some really beautiful (and large!) ones using Gunnera leaves, which grow well in the Pacific Northwest. We haven’t tried the “color-in-the-concrete” approach yet. We do ours in the natural color and then paint after curing is done. Our favorite style is to paint the front and back with black acrylic paint, then rub on powdered metallic powdered pigments (the type often used in Sculpey jewelry projects). We used the Pearl Ex powdered pigment series, and we find silver, gold, bronze, blues, greens, and purples work much better than the pastel colors. We only apply the additional coloring and metallic powder to the front. The back remains black only. Check out Pearl Ex pigments on the Jacquard Products website. I buy my Pearl Ex pigments from Michael’s or A.C. Moore. They sell them in sets of 12 different colors, or you can buy a larger bottle of one color. It doesn’t take much to cover the leaf. We use a soft cloth (and end up using our fingers) to rub in the pigments, which are very concentrated and go a long way. We find it best to paint the leaf with black acrylic craft paint in order for the metallic pigments to be intense in color when they are applied. The metallic pigments are stunning and you can get a variegated look using various colors! If you try this style, you’ll need to seal the front of your leaf with an outdoor spray sealant to keep the pigment from rubbing off. I seal the front of the leaves with Krylon’s Make It Last!® Sealer, which has a satin finish and dries (for handling) within two hours. Don’t expect the colors to hold up 100% in direct sunlight over a few years, though. The paint will chip a little but you can always paint over it and do it again to freshen it up. They still look good chipped and faded, though…sort of a shabby chic, relic-look! And you can try a new color scheme the next time around. Remember to seal after every repainting. Even if you hang or display yours indoors, you’ll still need to seal the pieces so they can be handled. And they certainly won’t fade as soon if they’re used as indoor art. If you want a solid colored metallic leaf, you can use inexpensive acrylic craft paint instead of the powdered pigments. First, paint the front and back of the leaf solid black (the leaf is porous so it will soak in the black) and then paint the entire front with your colored metallic acrylic paint. After everything is thoroughly dry, seal the front of the leaf with the Krylon Sealer. The good news: supplies for this project are CHEAP, CHEAP, CHEAP and the results are incredible! The downside? Those bags of Quickrete, etc. are HEAVY! Whichever method you decide to try (Portland cement type 1, Quikrete, Quikrete + vinyl patch, vinyl patch only), I’d love to see your results and will share them on this blog! Note to those of you who want to try it and live near me—if you buy the materials and lug them into your yard, I’m happy to come over and instruct! Re-post: Just how many hats does one girl need? One of the blogs I subscribe to is The Jackie Blog. This morning I received a post from her titled, “Enraged Knitting for Beginners,” which I thought was funny and it reminded me of my experience with trying to read crochet instructions. My friend Nanda tried to teach me knitting several years ago. I got the hang of it (if only briefly) and made what amounts to a not-so-absorbent coaster (I was aiming for a scarf, actually). Crocheting seems so much more productive and efficient to me. Knitting seems like 800 steps to gain a couple of inches. Maybe it’s just me. Remind me to show you a photo of the technicolor eye sleep mask I crocheted for Michael on a flight back home from visiting my family a few years ago. Just 20 minutes after he said, “man, I wish I had one of those eye thingies so I could go to sleep,” I completed my version of a sleep mask for him. He did not hesitate to put it on and promptly drift off to sleep. This was particularly funny to me because it looked like a coat-of-many-colors-pre-teen training bra over his eyes. To create it, I crocheted two 3-inch circles and connected them in the middle with a one inch chain. I crocheted two long chains and attached them to the side of each disk so he could tie it around his head. (I had to tear the yarn to make each component since you can’t bring scissors on board.) I really didn’t think he would actually wear it, but he apparently has no shame. What a (sleepy) trouper he was (is)! Below is a re-post of my crocheted hat obsession from September 2007. Now that winter isn’t far off and I’ll soon be tucking the garden in for the season, the yarn and crochet needle should be making an appearance soon. Just how many hats does one girl need? 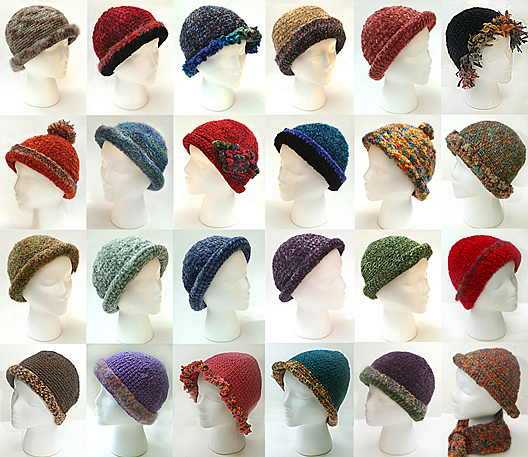 24 hats and counting, apparently—then add a few questionable scarves to the equation. Many years ago, in my formative teenage years, my mother taught me how to do a chain stitch, as well as single and double crochet stitches. That was the extent of my crochet education. (My younger sister, Kelley, never advanced beyond the chain stitch, but I must admit that she can make a really, really long chain stitch!) Sidebar: My Grandma Hester taught me how to use the same stitches to cover aluminum bottle caps. When we got a pile completed, she hooked them together and made dandy little trivets—now available for just 25 cents each at a yard sale near you. So every few years, tempted by the yarn aisle at a craft store (honestly, what aisle does not tempt me? ), I would buy a skein (or two or three) and attempt to make something wearable. I recall almost finishing a project (or two or three), but mostly I remember lots of half-finished unidentifiable yarn projects in a plastic bag in my closet. Fast forward to Christmas about four years ago—we were visiting my family in San Antonio, and on the drive up to see my younger sister in Dallas, I decided that “idle hands are the devil’s workshop” and bought some yarn and crochet hooks. I have to do something when I’m in a car for six hours—if I’m not driving, that is. Picking up crocheting again seemed logical. I could arrive in Dallas and still be social, creative, and productive—with something tangible to show at my destination. I decided I would attempt to make yet another (likely-never-to-be-finished) scarf. With my crochet skills a little rusty, the yarn began to curl and I couldn’t keep it straight. My mom (a.k.a. my crochet guru) said, “well, if it’s curling—make a hat!” Hmmmm…how does one make a hat? I started a chain stitch, then a single crochet, and let it weave into a circle until it began to resemble a yarmulke—since I’m not Jewish, I continued crocheting past that stage. I asked her, “How do you make it go down to form the sides of a hat—do you go tighter or looser?” Since she replied, “Yes” (a non-answer), I asked her if she had ever actually crocheted anything. That’s when I learned that although she knew chain, single, and double stitches, she had never made anything! All these years I had just assumed that the afghans, ponchos, pom-pon hats, placemats, and tissue holder covers on the couches, backs, heads, tables and toilets of friends and relatives across the country were all lovingly crafted by my mother (all of which are now available for just 25 cents each at a yard sale near you). I just began to wing it, and I stopped at the precise moment it resembled a hat (see photo, second row, 2nd hat from left——this is my first hat). I did this without any instructions, unless you count my mother’s advice. Mom wasn’t much help past the yarmulke stage, and reading crochet pattern instructions would make my brain hurt. Never seen a crochet pattern? Here’s just a sampling of the (it’s Greek to me) language of crochet: to shape crown: Ch 1. Rnd 1: Work 7 sc in first loop to form ring. Rnd 2: Work 2 sc in each st. 14 sts now in rnd. Rnd 3: Work [1 sc in next st, 2 sc in foll st] to end of rnd. 21 sts now in rnd. Rnd 4: Work [1 sc in next 6 sts, 2 sc in foll st] to end of rnd. 24 sts now in rnd, etc. Now, I’m smart enough to know what the abbreviations mean, but if I have to keep reading something in order to make it (sort of like having to read an entire software manual—who really enjoys that? ), it kind of zaps the joy out of creating for me. So, I confess that I am crochet-pattern-challenged, and must do it by sight, trial, and error. If my goal is a hat, I crochet until it resembles a hat and then I stop—ditto with scarves. Something must be working with my rather crude system because here I am—24 hats and 7 scarves later. I can make a hat in about an hour and a half or less (pretty quick results to satisfy a creative streak). It started out with simple hats made from one kind of yarn and has evolved (as you can see in the photo) into fuzzy trim and crochet flowers. I cannot make a simple hat—it has to be embellished now. You’ll notice several of the hats are plain—this was practice until I had the shape down pat. Then I got brazen and started adding fuzzy borders, balls, bric-a-brac, and brims. I crochet on road trips and instead of telling someone how many miles it is from here to there, I tell them, “That’s about a 3-hat trip for me!” Making hats (too many) is something to do during winter when I can’t putter around in the garden. 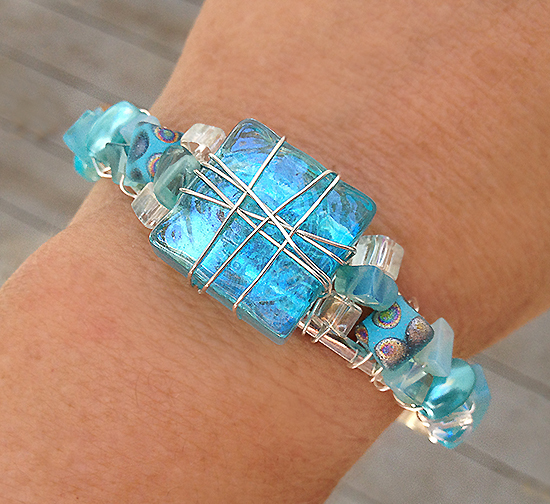 Some I make as gifts, but most I hoard for myself. And for an amusing take by another blogger on what not to crochet, go to the site below. Also look at “Top Posts” on the right and see some other funny crocheted items; the “Thongs” posting is funny, particularly the responses from readers. Leaf casting workshop in the works! My friend, Rob Bergsohn, and I are planning a fee-based workshop on making these leaf castings in September. Rob runs the Northern Virginia Portrait Photographers group on http://www.meetup.com. He hosts portrait photography workshops outdoors and in the studio as well as 2-4 hour Lightroom and Photoshop classes from his home studio in Falls Church, Virginia. Rob saw my botanical photography exhibit at Green Spring Gardens in spring 2012 and asked if I would host some workshops with him. We’re planning the workshop for sometime in September and the dates will be slated for weekend days to allow more participants to join. There will be two dates involved—one date to make the leaves (I’m guessing that session will be about 2-3 hours long) and another date for participants to return (after their leaves have cured) to paint and finish their creations. If you’re in the D.C./Virginia/Maryland area and think you might be interested in signing up, please e-mail me at dyerdesign@aol.com to get on our email list. When we finalize the dates cost and details, we’ll send out a notice to you. We’ll include a link so you can pay via PayPal on Rob’s Meetup group site. FYI—if you’re interested in learning Lightroom, check out Rob’s workshops. I took his basic Lightroom class a few weeks ago and learned a lot—for just $25 for a couple of hours of instruction. It’s an excellent value! He offers other studio classes on lighting and composition, so check out his meetup group page here: http://www.meetup.com/NOVAPhotography/ It’s a great bunch of photography-minded people and Rob is always adding new classes on a variety of topics relating to photography. You’ll need to sign up for a FREE meetup.com account before enrolling. Check out our fun craft project series in the summer 2013 issue of Celebrate Home Magazine! Download the issue free in the links below! Photography and design by Cindy Dyer. All rights reserved.